Around the thanksgiving table, many people have the tradition of telling something we are thankful for. It doesn’t take long to think of a few quick answers. Family, the food on the table, sunshine, good health, are replies that usually show up around the table with a lot of frequency. But there are always things in our lives that we just don’t want to give thanks for. These are the disrupters. They are the things that have created chaos, questions, and discomfort. This is the hard thanks to give, but give it, we can and should. I received an email from a fellow follower of Jesus. She had read my book, “Transformed Pain” and was struggling to accept how God was currently working in her life. As a young Mom, she is burdened with a severe, life-changing health condition. She’s been praying and she hoped that God would have given her healing and this thing would be gone by now. The doctors have given her little hope that this would happen. She asked me what Scripture might help her find a renewed joy in the Lord. My heart aches for her. I can’t imagine the pain of what she’s going through. After some reflection, this was my reply: “The Scriptural example that I thought of was God’s people Israel, in the wilderness. And day after day, for 40 years, they gathered and ate manna. It was a tasteless food. Every meal was a reminder of what they had known (leeks and onions by the Nile). I imagine, with every meal the idea of family dinners lost their attraction as their tastebuds were dying a slow death from lack of use. They complained. They longed. They asked for relief. They demanded relief. Except for one instance of judgment, God gave them no relief. Until they reached their spiritual and physical destination. We all have things God has brought into our lives that we would rather not have. Instead of giving thanks, we would rather just ignore it, put up with it, or even fight against it. How can we experience gratitude for the hard things? Here are a few things that might help us give hard thanks. Keep the big story in mind. Like everyday fits into a season of the year, your life fits into the movements of history. We should expect hot days in summer and cold days in winter. We should also expect hard times in this part of God’s story. This is a wilderness world. We are traveling toward a promised land. In the wilderness, we learn, struggle, hope, and follow. We find joy in the God who is leading us toward His future. Embrace Christ as the Author of your story. Every good story has twists, turns, tensions, movement and meaning. The wilderness was filled with this and it’s a great story for the annuls of history. This is what Jesus, as the author and finisher of your faith, is writing in you. Yours is a story that people will read for eternity. It won’t be boring because of what God has done in and through you. See grace everywhere. Think of grace and gift as synonyms. I hate taking pills, I take 9 per day. I hate kale, I eat it with my breakfast each morning. With my health challenges, these things are my manna. They are gifts of God’s grace. Even our challenges are gifts of God’s grace because they are the avenues by which we experience God and his transforming love. Long for Presence over circumstance. We were created to live in the presence of God. Christ makes it possible. In the wilderness God came in a cloud and pillar of fire. It was his presence with the people. If the choice is manna and God’s presence, or culinary delicacies and distance from God, choose manna! Prefer God’s presence over easier times. Say it aloud. Tell God, tell others your thanks. It is true that our hearts shape our actions. But it is also true that our actions shape and reinforce our beliefs and thoughts. Think of a hard thing in your life. Reflect and recount how you’ve seen God working in that. How has it taught you about life, forgiveness, redemption, endurance, faith, people, yourself, God’s ways? Say “thank you.” Use the comment section of this blog! In no way do I minimize the pain of hard times. But without thanksgiving, we can easily slide into resentment, bitterness and anger. We drift from the One who is with us. We let go of the One who loves us in the wilderness. There is nothing wrong with giving God easy thanks. But let’s not neglect the hard thanks. As always, thank you for being a reader of my Onward and Upward blog. Feel free to comment, share and subscribe by email above. You see the man was a Samaritan. Even without leprosy, this man wasn’t included in the club. 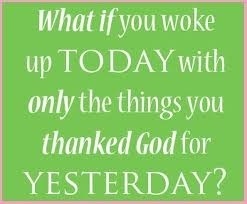 Why did he give thanks when the others went on with their day? Probably because he was a foreigner. You see, people who know their foreigners aren’t part of the system. They don’t know how things work. They don’t have networks, or connections. They are displaced and feel misplaced. They need help and they know it. If you’ve ever been a foreigner you know this to be true. Just watch one episode of The Amazing Race on Sunday evenings. As they travel the globe, they all ask for help some time. And when it is given, they are thankful! The nine who walked away may have felt they deserved their healing, after all they were Israelites – – they were God’s people. This little story makes me think there are two big gratitude killers. These can chew up a grateful spirit and replace it with demandingness and pride. 1) The first is “self-sufficiency.” Self-sufficiency refuses to see our need for help. It says, like the mistaken 3 year old, “I can do it.” When it comes to our relationship with God, we can’t do it. And if we think we are self-sufficient, it is only because we refuse to see that God and others have already helped us along the way. It kills gratitude. If you want to continue to increase the spirit of thanksgiving throughout the year don’t act like an insider with God. Instead, recognize that you are a foreigner to God’s grace. You can’t get it on your own and you don’t deserve what you do get. Let’s be thankful that he didn’t leave us on the outside looking in.